Michael Marsicano, Foundation for the Carolinas CEO, speaking at the Foundation's annual lunch. The new commitments came from BB&T of Winston-Salem and SunTrust of Atlanta, which announced in February that they're merging and putting their headquarters in Charlotte. 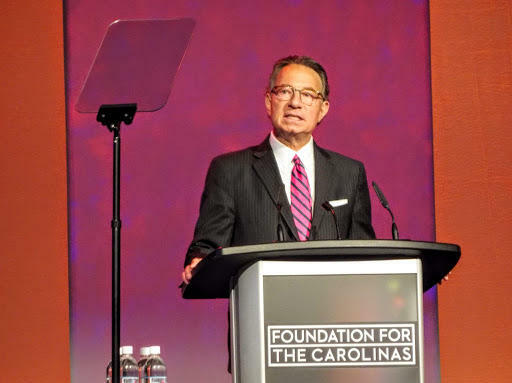 At the Foundation for the Carolinas' annual lunch uptown Tuesday, they pledged $30 million to affordable housing in the city. Of that, $10 million will go to the Charlotte Housing Opportunity Investment Fund, which foundation CEO Michael Marsicano said now stands at $31 million. Marsicano said that's "60 percent toward our $50 million investment fund goal and millions of dollars in other private sector commitments. That's terrific, but we need others to follow this example." The rest of the $31 million came from the foundation and Charlotte's other big banks — Wells Fargo, Bank of America, Barings, and Ally. On top of that, the banks and other companies, including developer Crescent Communities, are donating land and promising low-interest financing for affordable housing. New York-based Local Investment Support Corp., or LISC, has also pledged $25 million for housing and related services. Altogether, Marsicano said, that brings total private and public commitments over the past year to $203 million, including the city's expanded $50 million Housing Trust Fund approved by voters in November. BB&T and SunTrust's total commitment of $30 million, split evenly between the two banks, includes not only the $10 million housing fund investment but also $20 million more in below-market loans — for a total commitment of $30 million. "Affordable housing, stability of the family has always proven to be one of the most important focus areas to improve our economic mobility, so this is a big deal. But it really just scratches the surface," said Wes Beckner, BB&T's top Charlotte executive. About 1,700 people filled a banquet room at NASCAR Plaza for the lunch, which included a financial update on the foundation. Board of Directors Chair Todd Mansfield, who also chairs Crescent Communities' board, reported that the foundation's assets ended 2018 at $2.4 billion, about where they were a year earlier. Contributions to the foundation and its many funds totaled $363 million. That included $30 million from Derick Springsteen Close, most of the proceeds from the sale of his share of the Carolina Panthers. Close was a minority partner in the football team, which lead owner Jerry Richardson sold last July for $2.2 billion to David Tepper. Close set up the Springsteen Fund, which will focus on grants for human services, health, and education.